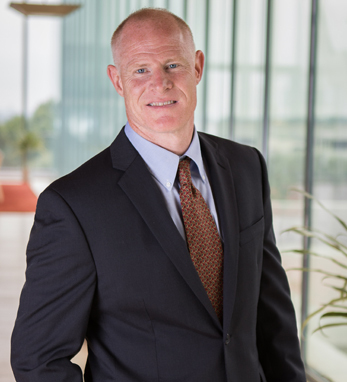 As vice president of technical operations at Novartis Pharmaceuticals Corporation in New Jersey, Brian Hanifin oversees the manufacture of products and innovative medicines for patients in need. Brian is a native of Suffern, New York, and obtained a bachelor’s degree in human resources at Marist College. He is a fourth-generation Irishman on his mother’s side, with roots in Cashel, County Tipperary, and Cavanaguillah, County Monaghan, and fifth-generation on his father’s, with ancestors from Ventry and Tralee, County Kerry. His ancestor, William Hanifin, left Ventry during the Tithe Wars in 1834, traveling on a timber ship to Quebec. The collapse of farming in upstate New York led him to Westchester County, where he found work in the Alexander Smith carpet mills in Yonkers. was generations ago, one thing that hasn’t changed is our pride,” says Brian. “I am proud of my ancestors, who sacrificed and endured so much hardship to establish themselves here.” Brian and his wife Kristen have two children, Sydney and Abby. They live in New York.